Arthur Axe was baptised at Holy Trinity Heworth, near York on November 14th 1886. His father, Henry, had been an army Colour Sergeant in the Royal Fusiliers (City of London Regiment), and Arthur was the youngest of eight children born to Henry and his wife Mary. The children’s birth places attest to the family’s movements. Thomas, the oldest, was born in Canada (c. 1866), William in Liverpool (c 1869), Emily in Portland (c.1871), Albert in India (C 1875) while Louis (c.1880), Ada (c 1881), Joseph (c 1884) and Arthur were all born in York where in the 1891 census Henry is described as Pensioner Paymaster Sergeant, 3rd West Yorkshire Regiment. Arthur attended Heworth Church Elementary School and the Yorkshire Gazette (20th Feb. 1892) lists him amongst the prize winners presented by the Dean of York . The Church of England Sunday School which the children attended also lists him amongst the prize winners (second in his class, Ada first in hers!) (Yorkshire Gazette 23rd December 1893). His musical gift is apparent in the report of his taking part in a concert in 1889 (York Herald 7th Jan.) when he was a pupil at Archbishop Holgate’s School in York. By 1901 Arthur was living at 17 East Parade York and was an apprentice organist. He is known to have played the organ in York Minster. Arthur joined the staff of St John’s College, Hurstpierpoint, Sussex, in 1908 as Director of Music. He was responsible for Chapel music and composed settings of the Magnificat and Nunc Dimittis. He composed music for the Shakespeare plays performed during his years at the school. He also helped to organize “Literary and Musical Evenings”, when he opened the evening with a piano solo. This was described in the School magazine in October 1914: “Mr Axe opened proceedings with a Beethoven Sonata, but it is getting hard to find an epithet for the indispensable and always pleasant item.” Music was not his only role. 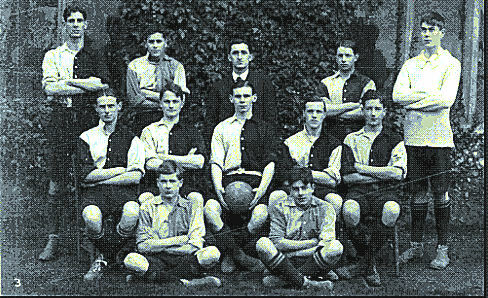 He also coached the 1st XI football team. 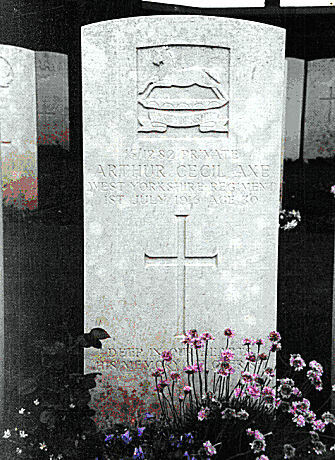 He is buried in Serre Cemetery No I (War Graves Commission). His headstone reads “Deep In Our Hearts His Memory We Cherish”.